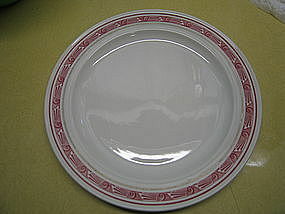 Dinner plate measuring 10 inches in width. It is backstamped 284. I've never been able to identify the pattern. The design reminds me of the plumes on the helmets of Roman soldiers. There are no chips, cracks, breaks, or rough rim. There are minor utensil marks and wear to the interior gold band. I have the same pattern without the gold band. I need your zip code to calculate the postage.